It was political compulsion of keeping Congress out of power that compelled the BJP to once again join hands with Jharkhand Mukti Morcha (JMM) despite the party not supporting the cut motion against UPA regime in Parliament. Rivalry between Hamirpur MLA Urmil Thakur and former chairman of the state media advisory committee Rajinder Rana has once again come to fore with the passing of a resolution against the latter by the BJP Sujanpur Mandal. Chief Minister P.K. Dhumal today said Prime Minister Dr Manmohan Singh had assured him that he would reconsider Himachal’s demand for restoration of the central excise duty exemption after consulting his ministerial colleagues. With extension of special industrial package to Himachal turning out to be the biggest political issue in the hill state, Union Commerce and Industries Minister, Anand Sharma today said Himachal had been one of the biggest beneficiaries and barring the central excise exemption for which there was already a sunset clause, all other concessions under the industrial package were still continuing. Union Minister for Commerce and Industry Anand Sharma said today that the BJP government should convince the BJP-supported Punjab government to stop opposing extension of industrial package in Himachal and that he had already taken up the state’s cause with the Prime Minister and the Finance Minister. The Himachal Pradesh High Court has directed the Secretary (Revenue) and the Shimla Deputy Commissioner to finalise eligible benefit to residents of Jubaal tehsil of Shimla district for the damages suffered to their corps due to hailstorm in 2007 within three months. The state electricity board pensioners’ welfare association has resented the callous attitude of the board authorities towards the problems being faced by pensioners after implementation of the revised pay scales. Addressing a press conference here today BJP national chief Nitin Gadkari said though the JMM had voted for the UPA much against the BJP’s wishes on the cut motion, the main endeavour was to keep the Congress out of power. “Had the President’s Rule been imposed in Jharkhand, the Congress would have managed to capture power by hob-nobbing with smaller regional parties,” he remarked on the uncomfortable question of agreeing to form the government with the JMM. 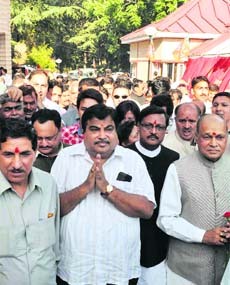 Gadkari was highly critical of the decision of the Centre to withdraw special industrial package to Himachal. “There is no justification at all in taking away what has been given by the NDA regime,” he said. He added it seemed the UPA regime was penalising people of Himachal for voting the BJP to power. While lauding the state government schemes like the CFL power saver, subsidised ration, poly house, Doodh Ganga and apple rejuvenation, he said the Centre must learn from the BJP, headed by Chief Minister PK Dhumal, how to govern and come out with pro-people and eco-friendly policies. He said it was the result of wrong economic policies and poor governance of the UPA regime which had led to price rise. “The country is plagued with starvation, malnutrition, suicides, price rise and poverty. However, no effective steps have been taken by the Centre as godowns are overflowing and foodgrains rotting,” he lamented. Gadkari spoke more about business than politics and eulogised his own achievements in having excellent business acumen as he successfully spinned Rs 5 crore into Rs 5,000 crore. “If there is a will there is way and I have amply proved it in business. Had the UPA regime been serious about checking price rise, they could have taken effective steps,” he remarked. He added had he not become the BJP chief, he had set a target of generating 25,000 more jobs in the next two years. He said considering his success in power generation and making express highways, people mostly thought he was a civil engineer. “However, I am a law graduate and an MBA,” he said. The mandal had recently passed a resolution taking strong note of Rana’s activities being carried under the banner of social organisation Sarvakalyankari Sabha. A few members of the party reportedly even went to the extent of demanding action against Rana for continuing “parallel activities by using BJP platform” and demanded his expulsion from the party. This is not for the first time that the party forum has been reportedly used against each other by these two leaders to settle personal scores. Earlier too, Rana’s supporters at Sujanpur Mandal BJP meeting, had demanded action against Thakur through a resolution for allegedly working against the party’s interests. Though this matter was buried at that stage, acrimony among the leaders continued. Both Thakur and Rana have been a cause of discomfiture for the party due to their public outbursts against each other on several occasions in the past. “Moreover, since the party had to face an ugly situation during 2003 assembly election when one party leader contested as rebel candidate leading to defeat of the BJP candidate, many party leaders were wary of activities of a party man under the banner of a social organisation,” Thakur added. Dhumal, along with former chief minister and Rajya Sabha MP Shanta Kumar and state BJP chief Khimi Ram, today met Manmohan Singh in Delhi and submitted a memorandum for restoration of the special industrial package. “We have impressed upon him that the premature termination of the excise duty exemption component has done great injustice to Himachal and rendered futile the efforts of the state in synchronising its policies with the special incentive package,” he said. He urged the Prime Minister to extend the industrial package up to March, 2013, as given originally by the then NDA regime headed by Atal Behari Vajpayee in January, 2003. He requested restoration of the excise duty exemption component without any cut-off date or at least up to March 31, 2013, for north-western hill states on the analogy of north-eastern hill states, where similar incentives have been extended up to 2017 by the Union Government. Dhumal said the state government had created massive infrastructure in industrial belt of states to attract new industrial investment and had suitably modified its industrial and other policies so as to complement and work in tandem with special industrial package. He said the state rightly deserved the continuation of special industrial package due to its peculiar and tough geographical conditions, its industrial backwardness, lack of rail and air connectivity and locational disadvantages for industries as compared to its neighbouring states. The Chief Minister said he was thankful to Anand Sharma for supporting extension of the excise duty exemption component in his letters to the Prime Minister. “I hope the Congress leaders too will take up the issue separately with the Prime Minister and Sonia Gandhi so that people of Himachal get injustice,” he said. Mindful of the fact that the BJP was holding a “nyay” rally here tomorrow to highlight the discriminatory attitude of the Centre, he was very emphatic in reiterating that the UPA regime was very fair and judicious and there was no question of discrimination against any state. He, however, ruled out reversion of the decision to withdraw central excise exemption. “I was pained and anguished to hear about allegations that the Centre was discriminating against Himachal as facts and figures of numerous schemes and funds present a totally different picture,” he said. Realising political implications of the BJP accusations, he spelt out several new schemes like setting up of a Spice Park at Nadaun at a cost of Rs 27 crore and two regional mini parks at Sirmour and Shimla, an organic tea farm on 150 acres at Palampur, rejuvenation of 10,000 hectares of land under tea plantation and formation of Aqua Culture Society and chilled room and refrigerated transport for trout. He said he had personally taken up the industrial package issue with the Prime Minister who was very sympathetic. However, there was strong opposition from chief ministers of certain neighbouring states about continuation of the package to Himachal. He virtually said there was no justification in the state government’s demand of restoring the industrial package as subsidies on capital investment, transport and income tax were still continuing. Accompanied by high-ranking officials from his ministries as well as leaders from the industry, he spelt out all that had been done for Himachal. It was after careful assessment of the situation by three central teams that the priority areas had been identified and schemes envisaged accordingly, he added. He said it was this month itself that Rs 30 crore had been released to Himachal as capital investment subsidy and a huge amount as transport subsidy. He also said that it was surprising that the CII, northern region, of which Himachal too was a part, was also stiffly opposed to industrial growth here. Addressing a gathering of industrialists after inaugurating Rs 70.54 crore Common Effluent Treatment plant at Kenduwaal near here, he said the centrally aided project had got maximum funds of Rs 60 crore under the Industrial Infrastructure Upgradation Scheme (IIUS) and it would treat 60 ML effluent per day. He said a skill development centre at Parwanoo would become functional from June and this would later be upgraded to a skill development institute. He said a National Manufacturing Policy was being formulated and since it was imperative to involve beneficiaries in policy making, stakeholders were being involved in its formulation. The Union Minister, while rejecting the state’s plea of the central package having expired, said only excise benefits had been curtailed while rest of the benefits continued to exist. He said the state’s interests were being taken care of and it had received the highest amount of funds, Rs 112.91 crore, under the special category states while capital subsidy of Rs 29.84 crore, out of the total 45 crore, would be released this financial year. The issue of pending transport subsidy of Rs 15 crore too had been resolved. Efforts were afoot to bring big industrial houses in various sectors, including IT, agro and food processing and electronics, he added. Earlier, Industries Minister Kishen Kapoor and MP Virender Kashyap exhorted the minister to plead the state’s case for extending the central package. Kashyap, unaware of the latest stand of the Opposition, went on to say that they were thankful that the Opposition would join them in seeking extension of the package. While passing this orders, a bench, comprising Chief Justice Kurian Joseph and Justice RB Misra observed that in view of documents on the record, this issue required consideration by the department. The order came on a petition filed by 13 residents of different villages from Jubbal tehsil of Shimla district. According to the petitioners, their crops were badly affected by hailstorm in April-May, 2007. The horticulture development official and tehsildar of Jubbal block assessed the loss and identified the eligible persons. The Rohru SDM, in August 2007, reported the loss of Rs 60 lakh as assessed by the tehsildar and 1,350 cases were identified for payment of damages. The petitioners added that the DC had informed them that the matter was referred to the Additional Chief Secretary in July,2007 and after receipt of the necessary funds, same would be disbursed to the eligible persons. Two years had lapsed but the amount was not released in favour of eligible persons, the petitioners added. The association pointed out that inability of the board to issue clear-cut orders regarding payment of arrears of DA and revision of pension had led to a chaotic situation as a result of which banks were refusing to disburse pension. Even the pension of those who retired before January, 2006, had not been revised.